I have made different versions of banana bread or loaf before. Some have dried fruit, others have nuts inside but always tastes delicious and goes down well with my family and friends. Last Saturday morning I was beginning to feel better after a long week of looking after poorly children followed by my own stinking head cold. My head throbbed and my ears were bunged up. All I had the energy to do was to flop on the sofa reading my Kindle or watching the telly. There wasn’t much food in the house and I didn’t have the inclination or the energy to haul myself round the shops. In the end my hubby said he would get a few things in and he would bring back a sandwich for lunch from the bakery. It did make things a lot easier but I noticed about 5 very ripe bananas beginning to hum in my fruit bowl. As I don’t like wasting things I thought I’d try and make some banana bread with them. The Clandestine Cake Club Cookbook has a delicious Banana Bread recipe in it, in fact it is the very first recipe in the book. It was created by Liz Laidlaw of the Cobham and Oxshott CCC. 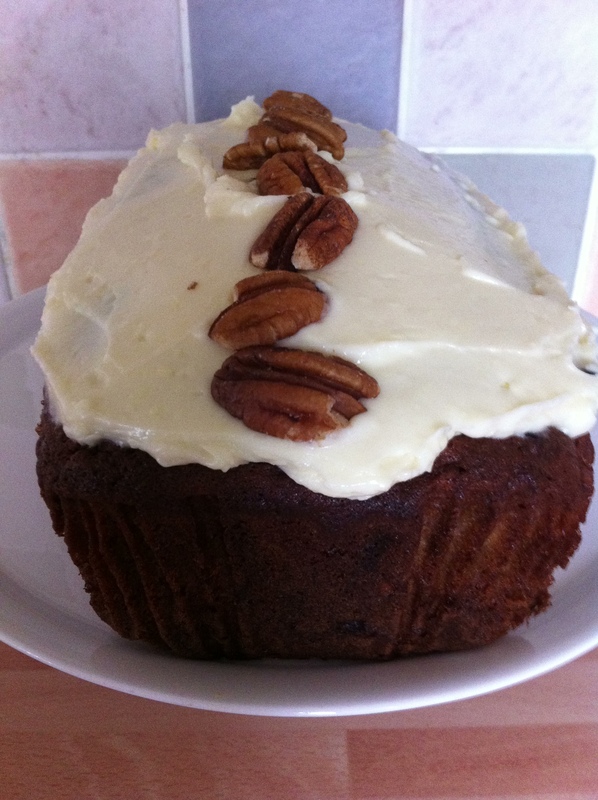 I liked the look of the recipe from the picture as it features a rather delicious looking cream cheese icing and is finished off with a sprinkling of pecan nuts which I think are a match made in heaven with bananas and cream cheese. I just had to try it out for myself. The recipe introduction says “this is the perfect recipe for using up ripe bananas” and also that it “will keep for up to five days if stored in an airtight tin and will become even more moist”. I thought this was a funny comment because banana bread never lasts that long in our house. Even if I put it in the freezer for safekeeping it mysteriously disappears. I am lucky if it lasts a day or two at a stretch! So, on with the recipe. It was a quiet house, only me and the dog. He was snoozing in his dog basket so I got down to my baking. My loaf tin was greased and lined with a special loaf tin liner and I heated the oven up. Butter and golden caster sugar were creamed together with a wooden spoon and then I added the eggs carefully, followed by a some plain flour. As I was careful the mixture did not curdle. In a separate bowl I combined milk, lemon juice and vanilla extract. The milk was meant to be whole milk but I didn’t have any so I had to manage with skimmed milk and hoped for the best! Then I added the rest of the flour and some bicarbonate of soda. Finally mashed bananas were folded in. The smell of the mixture was absolutely gorgeous as I tipped it into the tin and put it into the oven. While the banana bread was baking I went and flopped back on the sofa trying to work on a cross stitch alphabet sampler I’m doing at the moment. I took the timer into the lounge with me and kept going backwards and forwards to check on the bread. After about an hour it was ready and I left it out on a rack to cool down while I made the cream cheese frosting. The cream cheese frosting was an optional extra as the banana bread would have been just as delicious without. The recipe notes also suggested you could add buttercream or glace icing to the top if you wished to. I wanted to try the cream cheese icing and used full fat Philadelphia as it always gives great results. To make the cream cheese icing I simply beat the butter first, then added the cream cheese and some vanilla extract. Icing sugar was sifted in at the end. It made a gorgeously thick frosting which I smoothed onto the top of the loaf. The final touch was some pecan nuts. In the book the pecan nuts were chopped but I put whole ones on instead. When it came to lunchtime the banana loaf came out along with a ham salad sandwich. The cake was meant to be for 12 servings but I’m ashamed to say we did not get 12 slices out of it, only 8 as I cut the pieces far too big. Everyone enjoyed a large slice and as orignally thought it had all disappeared by the following day! It was worth it though and I enjoyed making the cake so much I will make it again and again. Banana Bread with a luxurious cream cheese frosting. Previous Post Red Nose Day 2013- Baking For Comic Relief.